A home may have the latest and greatest features and technologies, but if the outside of the home — the first thing a home buyer sees — isn’t appealing, it will be difficult to get them in the front door to see the amazing interior. During the past decade, windows have become architecturally styled design elements in virtually endless colors that can significantly improve the home’s appearance and buyer traffic. Between 1955 and 1985, most homes were built with wood, aluminum or white vinyl windows in plain rectangles or squares with no grille patterns or details to differentiate one from another. With the growing advancements in window design and increased focus on architectural details, there are a number of options for home builders to consider today. Operating style, grille style, grille pattern and color are important window elements to consider when building an architecturally authentic home. The combination of these choices has a tremendous effect on the historical accuracy and general aesthetic appeal of the window system. If these window design elements don’t match the architectural style, the home can look out of balance. Window operating style — many new homes today are built with single-hung windows, but replacing them with other operating styles such as double hung, casement or awning can add function and help highlight a home’s historical styling. For instance, single- or double-hung styles work well for traditional Craftsman or Shingle homes, but for other home styles like the Prairie or Mid-Century Modern, think about suggesting casement and awning window combinations. Grille style — simulated divided lites (SDLs) are an excellent modern alternative to true divided lites. The benefit of today’s window choices gives home owners the best of two worlds — the energy efficiency of advanced glass technology and a historical look. Grille pattern — grille patterns go hand in hand with grille styles, but the pattern is what takes a home from cookie-cutter spec home to timeless design. For example, the Victorian or French Country two-over-two pattern is a very powerful element that gives the home an elegant feel, while a six-over-six style is a strong architectural element of classic, colonial homes like the Georgian. Color — with advancements in color technology, builders can now enhance exterior elevations with darker colors that complement today’s darker siding and stone veneer hues. Black, green, red or bronze windows provide “pop,” which can make a significant improvement in the overall look of a home exterior. Windows -aluminum-clad exterior/wood interior window and patio door product line, available in multiple shapes, options and colors to match various architectural styles. Look for traditional window colors plus bolder options such as Evergreen for a pop of color and Dark Bronze to mimic the look of weathered aluminum windows. Also include casement shapes such as extended eyebrow, extended quarter eyebrow, extended round and extended quarter round, offering style and function. The Mira Premium Series and other Ply Gem Windows products are a part of The Designed Exterior by Ply Gem, a complete exterior home solution from a single manufacturer that includes windows, siding, stone veneer, fence, rail, accessories and accents, helping builders begin conversations with home owners by providing inspiration for architectural styling, color selection, window design specifications and suggested style and grille patterns. For more inspiration, visit www.plygem.com. One cost-effective upgrade that can transform a client’s plain entry doors into neighborhood showstoppers — and boost remodelers’ profits too — is the addition of beautiful decorative doorglass. Installation in most steel and fiberglass doors is easy, and it can be done on site in less than an hour. 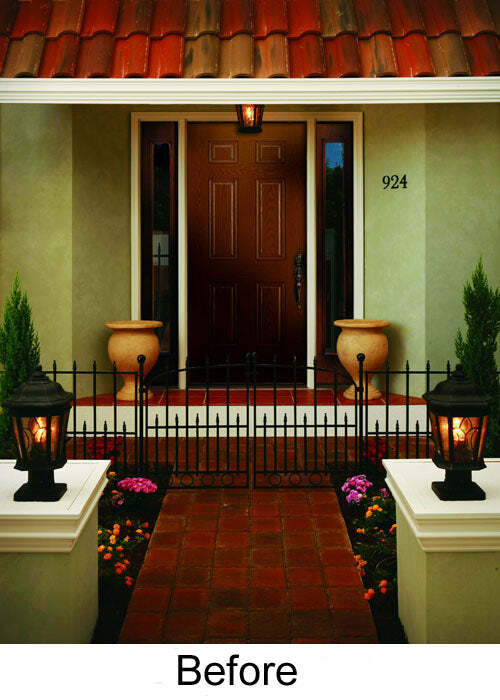 “Decorative doorglass provides home owners with a cost-effective way to update their home entry and significantly improve curb appeal,” said Randy Brown, channel marketing manager for ODL USA, ODL, Inc. “Builders can replace or install doorglass for a quick and efficient renovation project. New doorglass can make a huge difference in visual appeal and perceived home value, and it can also improve energy-efficiency.” Decorative doorglass also provides added privacy and security. Clear glass is transparent, allowing a clear view. Opaque glass shows shadows and color, but no distinguishable shapes. Decorative doorglass comes in a wide variety of textured designs, so if privacy is the client’s goal, builders should select a design featuring opaque glass texture. Once the home owner has selected a doorglass design, it can be added to a new door with a quick precision cut, or by popping out the existing glass in an older door (see the before and after doorglass installation photos). Besides good looks, some decorative doorglass is thermally sealed between safety glass to improve energy-efficiency. Also, doorglass is surrounded by high-performance frames that are maintenance-free and can be stained or painted to match the existing door. If clients decide to sell their house instead of remodeling it, here are a few recommendations from Realtors around the country to boost the entry’s curb appeal. Add Lighting — Exterior lighting is important because it makes the eye focus on the entry. It also enhances safety and security, illuminating the house numbers and steps. Select a fixture style that complements the home’s architecture. Upgrade the Door — The front door is an introduction to the home. Choose a door made of a durable, low-maintenance material that is pre-hung and ready to install. Steel and fiberglass doors require less maintenance than wood and tend to be more energy-efficient. 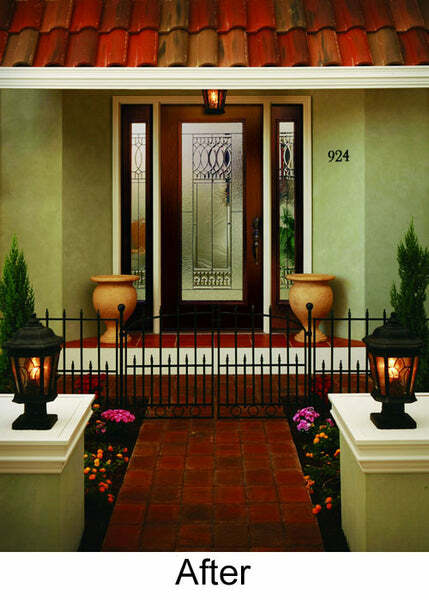 Install decorative doorglass to enhance the door’s features. Paint/Stain the Door — A fresh coat of paint or a beautiful stain on the entry door makes the home look well maintained and inviting. Select a color that enhances the architectural details of the home’s exterior. Re-face the Steps — Turn a dull concrete walkway into a showstopper by covering it with stone. A natural gray granite veneer on the risers is a good choice, as well as clay tiles, split bricks or limestone pavers. Add Containers and Flowers — Large potted plants at the entrance anchor the entry. Choose attractive, weatherproof containers made of cedar, molded fiberglass, glazed ceramic or metal, and fill them with colorful flowers and plants.